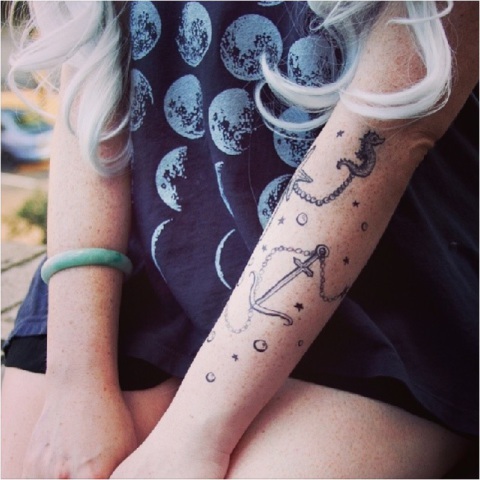 Tattoo pens allow you to draw your own semi-permanent tattoos. Love tattoos but don't feel like committing your life to one? Or maybe the pain is keeping you from the tattoo parlor? Either way, tattoo pens are on the market, and this invention can finally give you the awesome tattoo you've always wanted. Semi-permanent cosmetic skin pens will make you look like a rebel without the act of rebeliion. It seems the biggest issue these pens have is the inability to last. Odds are, your cool, new tattoo won't be around for two weeks. It will likely stick for three to four days and wash off. Stargazer is honest when it comes to how long your act of rebellion will last. You're constantly shedding skin layers, and these pens are really only staining the outermost layer. In a few days, your design will be gone, but, hey, you were looking for a temporary tattoo, after all. Tattoo pens work well for Halloween, photo shoots, testing a tattoo design, or days you just want to have a little fun. If you want something more permanent, you'll have to face the tattoo parlor. To purchase 2 Week Tattoo Pens, click here. Stargazer pens are sold here. You can always find different brands on Amazon, as well. To keep up on my beauty and anti-aging innovations blog, click here.